I'm trying to deploy an Azure Proxy in B&R 9.5 in order to improve the performance when restoring to Azure. Restoring to Azure without the proxy works fine, it's just I'm looking for any opportunity to make it faster. We connect to Azure from our on-premises environment via a site-to-site VPN and the subnet that contains our VMs and where I want to place the Azure Proxy does not have direct access to the internet. We have custom routes within Azure that direct all internet traffic through a pair of NG firewalls in order to provide improved logging and easier management of firewall rules than what can be achieved using Network Security Groups. VMs in this subnet don't have public IPs as the custom routes stop them working. All inbound and outbound internet traffic to the subnet flows through the public IP assigned to the NG firewall pair. 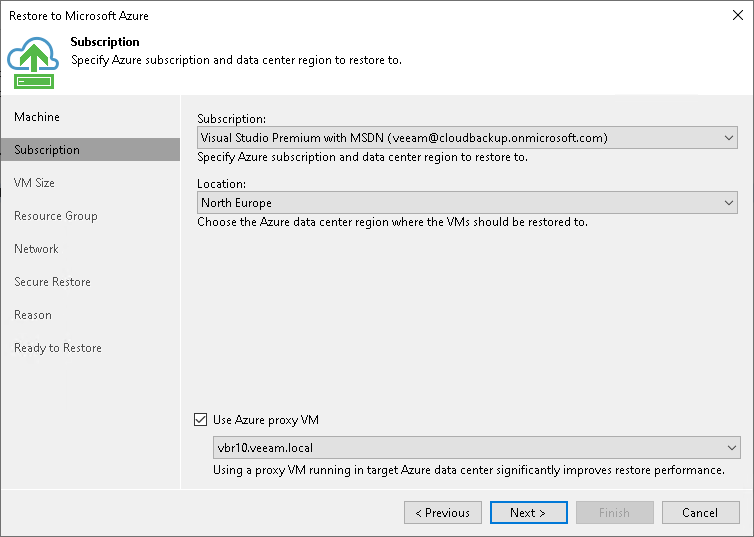 The problem is that when deploying the Azure Proxy the VM appears to be created sucessfully, but then Veeam attempts to contact the VM on its public IP in order to install the transport components, which due to our custom routes, fails. What would be ideal is if you could deploy the Azure Proxy and configure Veeam to contact it via a private IP rather than a public IP. That way we could still get the Azure Proxy dedupe and compression benefits when restoring to Azure via the site-to-site VPN. Your request sounds valid and it certainly will be given an additional thought in one of the next product releases. Also, you seem to have quite decent connection to Azure DC, so, may we ask your to compare performance with and without restore proxy and share resulting data with us? This would be highly appreciated. I followed your steps above and the data transfer did go over the VPN, but we still had to add some firewall rules to allow the job to complete fully. I can't say there was much of a performance improvement, but the VM was just a basic Windows install, so maybe there wasn't much scope for dedupe and compression. Is there anywhere to see stats on dedupe and compression for a restore? The partner side network has point to point connectivity to Microsoft side. It seems that Azure Proxy Wizard deployed in a such network can't utilize ExpressRoute connectivity model. That would be beneficial, if we could configure a private IP range for a proxy appliance at one of the wizard steps. As mentioned above, for now you can bypass Azure wizard and use "Add MS Windows Server" one instead. After that, you would be able to select this server as a Proxy VM in DR2MA wizard. In this case, ExpressRoute connectivity model should be leveraged during restoration process.